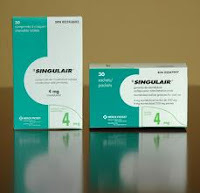 Singulair (generic montelukast as of Aug 2012) is a medication often prescribed for asthma as well as allergies and works by blocking the leukotriene receptor. This mechanism is different than that found in common allergy medications like claritin and benadryl which work by blocking the histamine receptor (anti-histamine). Singulair has also incidentally been found to possibly help reduce the size of tonsils and adenoids. Given this beneficial affect, singulair may be a helpful intervention in those kids with mild obstructive sleep apnea or nasal obstruction due to adenoid hypertrophy avoid surgical intervention (tonsillectomy and adenoidectomy). Recent research published in Sept 2012 suggests that singulair may lessen symptoms in children with non-severe apnea and potentially allow them to skip the surgery. In the study, 46 children with non-severe sleep apnea received singulair or a placebo for 12 weeks. The kids who received the drug showed improvements in their sleep apnea, their sleep-related symptoms, and the size of their adenoids compared to the placebo group. There were no side effects seen among kids who took the study drug. Another larger study conducted in 57 children in 2016 confirmed these findings. This study was also double-blinded, randomized, and placebo-controlled. Beyond singulair, steroid nasal sprays have also been found helpful to reduce adenoid size. Singulair can be given from the age of 1 year old. Leukotriene modifier therapy for mild sleep-disordered breathing in children. Am J Respir Crit Care Med. 2005 Aug 1;172(3):364-70. Epub 2005 May 5. Leukotriene pathways and in vitro adenotonsillar cell proliferation in children with obstructive sleep apnea. Chest. 2009 May;135(5):1142-9. Epub 2008 Dec 31. The role of mometasone furoate aqueous nasal spray in the treatment of adenoidal hypertrophy in the pediatric age group: preliminary results of a prospective, randomized study. Pediatrics. 2007 Jun;119(6):e1392-7. Epub 2007 May 28. Intranasal corticosteroids for nasal airway obstruction in children with moderate to severe adenoidal hypertrophy. Cochrane Database Syst Rev. 2008 Jul 16;(3):CD006286. Montelukast for Children with Obstructive Sleep Apnea: Results of a Double-Blind, Randomized, Placebo-Controlled Trial. Annals of the American Thoracic Society, Vol. 13, No. 10 (2016), pp. 1736-1741.